Interrupted A-League game against Central Coast Mariners. The referee was forced to pause Wellington Phoenix’s 3-2 win over Central Coast Mariners when a pitch invader emerged from the stands, got ahold of the ball and was able to take a wild strike at goal. 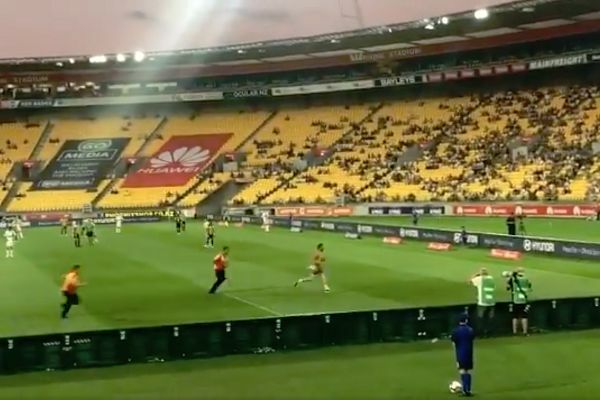 The A-League game between the two Australian sides at Westpac Stadium on Saturday was interrupted when a fan without a shirt managed to make it onto the pitch. There were cheers from the crowd as the man got the ball under control and dribbled down the wing unopposed before aiming his shot. Eventually, a couple of stewards arrive on the scene. With one rather more keen than the other, they’re taken on a quick chase before confronting their target when he appears to give himself up. A thrilling contest saw Wellington come back from two goals down after the visitors were reduced to ten men in the 46th minute.